Thomas Street is named after Thomas Lipsenard, one of the three sons of Anthony Lipsenard, the owner of the Lipsenard Meadows, through which this street was cut. Thomas' brothers also got streets named for them--Leonard Street and Anthony Street (now Worth Street)-- plus there's a Lipsenard Street, apparently named for the dad. The brothers' mother was Alice Rutgers, who belonged to another wealthy land-owning family that gave a lot of money to a certain school in New Jersey. (55 Hudson): Washington Market School is in the a striking 1890 red-brick McKim, Mead and White building (though I've also seen this building attributed to Edward Hale Kendall). Actor Harvey Keitel has lived here. 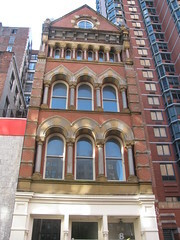 Corner (50 Hudson): Was Lucius Pitkin, real estate firm founded 1885. Corner (145 W Broadway): A French brasserie with Art Deco style, this bar/restaurant helped make Tribeca the fashionable neighborhood it is today-- originally attracting art scene heavyweights like Warhol and Basquiat. It introduced the Cosmopolitan in the early 1980s. 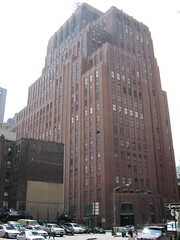 The exterior was featured on the cover of Bright Lights, Big City. The building dates to 1888, desighned by William Kuhles. It became the Tower Cafeteria c. 1935. 62: An unusual neo-Gothic cast-iron building from 1865 houses Megu, a high-end sushi restaurant-- formerly Obeca Restaurant & Bar. Corner (155 W Broadway): This 1865 Renaissance Revival building by Jardine, Hill and Murdoch originally housed J.C. French & Sons, manufacturers of sidewalk trapdoors and skylights. 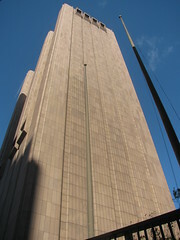 Now it's a supplementary courthouse for the New York City Supreme Court. 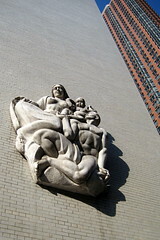 Block (199 Church): State Insurance Fund Building. Houses a non-profit organization established in 1914 to provide low-cost workers' compensation insurance to businesses. 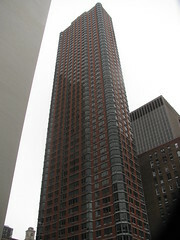 10: A 52-story red-brick condo built in 1991 to a design by Schuman Lichtenstein Claman and Efron. The lobby is by David Rockwell, designer of hot spots like Nobu and the W New York. 8: A Victorian Gothic gem built in 1875-76. The architect, Jarvis Morgan Slade, had a promising career cut short by his death at the age of 30. Corner (315 Broadway): At approximately this spot was the Rutgers mansion, which later housed the Ranelagh Garden tavern from 1765-69. The Rutgers family--beer merchants who helped found the university--owned the property until 1790. 41: This was the address of the brothel where Helen Jewett, a prostitute well-known for her beauty, New York City's most famous and beautiful prostitute, was brutally murdered with an ax on April 10, 1836. A young clerk named Richard Robinson is believed to have been the culprait, but was acquitted in a dubious trial. Corner (319 Broadway): Former Met Life Home Office; ''a cast-iron gem of the first order'' (AIA Guide), designed by David & John Jardine in 1869 and fabricated by the Daniel D. Badger Architectural Iron Works. On the ground floor was Stark's Veranda, an Italian restaurant that opened in 1894 and closed c. 2009. In the 1840s, this was the address of John Anderson's cigar store, where Mary Rogers worked; her puzzling death in 1841 inspired Poe's ''The Mystery of Marie Roget''. 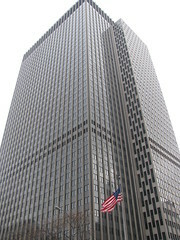 26 Federal Plaza: The Jacob K. Javits Federal Office Buildingis named for the U.S. senator for New York from 1956 until 1980. He's remembered for his work passing the Civil Rights Act of 1964 and the War Powers Act of 1973. They don't make Republicans like him anymore. 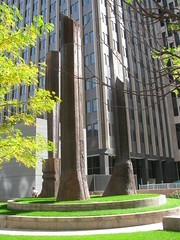 The four cast-iron pylons in Federal Plaza are the Manhattan Sentinels, a 1996 sculpture by Barbara Pepper. What am I missing on Thomas Street? Write to Jim Naureckas and tell him about it.